Dr. Harald Vaher attended the Ohio State University College of Optometry. After graduating he completed a residency at The University of Alabama Birmingham College of Optometry. 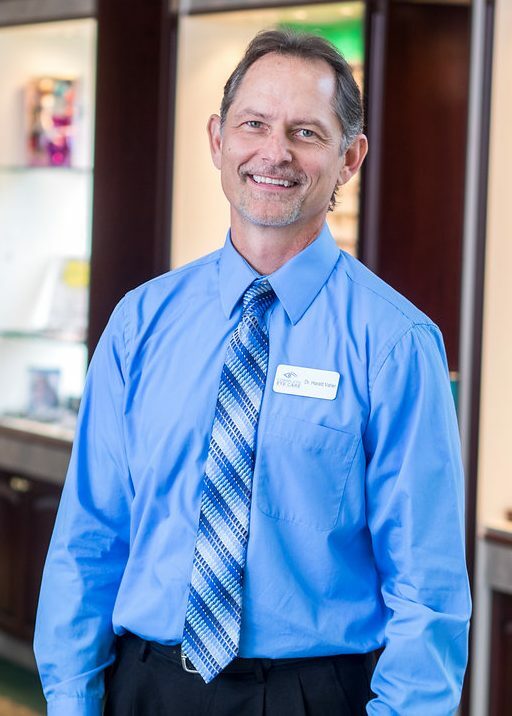 Dr. Harald Vaher started Complete Eye Care over 20 years ago and has been delivering high quality vision exams in a friendly manner ever since. His goal is to provide personalized service with high quality products and be a good value to his patients. Dr. Vaher has an avid interest in fitting bifocal contact lenses to treat Presbyopia. He enjoys time with his patients to get them great comfort and vision. Dr. Vaher is known for the kind patient care he provides each patient, taking the time to learn each patient’s individual needs. As an avid golfer, he enjoys sharing with fellow golfers special lenses made just for the sport. These provide the precise vison needed for the golf course environment. Dr. Vaher appreciates the hundreds of referrals his many loyal patients have sent him over the years and the trust they have placed in him. He also enjoys being an active father to his two daughters. He can be seen regularly at swim meets, volley ball games, dance recitals and piano lessons. He enjoys spending time with his family, traveling and his golf game.